Composite Prime was recently chosen by BBC’s DIY SOS to supply a full decking solution to a family in Torquay. Thanks to the many benefits our decking hosts, the boards were perfect for the family. Single dad, Stuart, suffers from Multiple Sclerosis and was having trouble using the stairs in the two-storey house. It was essential that the outdoor area was easy for Stuart to use when in his wheelchair. Stuart’s 15-year-old daughter, Lauren, has grown up as a young carer, while his mum, Lin, who is completely blind, walks across town every day from her flat to Stuart’s house to help care for him and assist Lauren wherever she can. A huge part of the renovation was the transformation of the garden, with the whole outdoor space being transformed into an idyllic area for relaxing. Our decking was used to create an attractive patio and impressive walkway/ramp leading to the lower level of the garden. 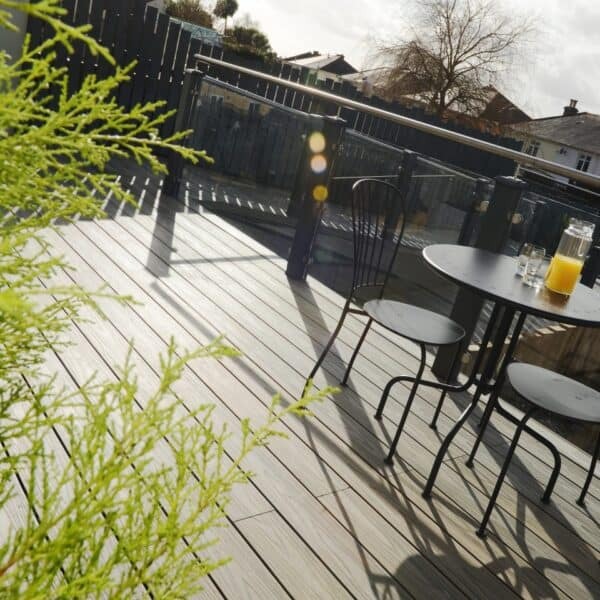 We provided 60sq metres of HD Deck Dual in the colour Antique (special thanks goes to Arnold Laver who generously gave up their time to deliver the decking free of charge), which has a remarkable likeness to timber thanks to its natural wood grain, complementing the garden perfectly. This decking option is also double sided, offering two colour options in one board and is low maintenance – ideal for the family as no laborious staining or expensive treatments are required. The BBC DIY SOS team wanted to ensure there was space for the family to spend important time together eating meals on the patio, relaxing on the lawn or simply soaking up the Devon sun and getting some fresh air. Composite Prime’s decking helped to make that happen. As well as transforming the garden, the team completely reconfigured the house for the family, creating a more accessible space for Stuart to call home. As found with all our decking solutions, the HD Deck Dual is slip-resistant, so Stuart and Lin will no longer have any trouble making the most of the garden. It was great to be able to help this inspiring family and donate the products needed to create the ultimate garden space for the family to enjoy. It was important to make the outdoor space as accessible as possible and our decking was able to make this happen. The range of benefits our decking products host made it the ideal fit for this project, and it’s fantastic to know this family now has a house they are proud to call home. Keep an eye out on BBC one for the next series of DIY SOS.